There are carwash guys in mall parking lots. And parking garages. They wear uniforms, carry receipt books pre printed and are very efficient. They’re all over, they push little carts with I’m not sure what inside them, but lemme tell you, they do a bang-up job of washing your car while you’re shopping! Cheap too, around $6-8 USD if my conversions are right, and they do it year round! Communicating with them can be an issue, though. They seem to recognize a few phrases in English – “How much?” they can answer, and if you hold up fingers “How long?” they can answer. Outside of that, you’ll hear “yes yes yes” which seems to be the standard service answer. And it does not necessarily mean “yes” at all. 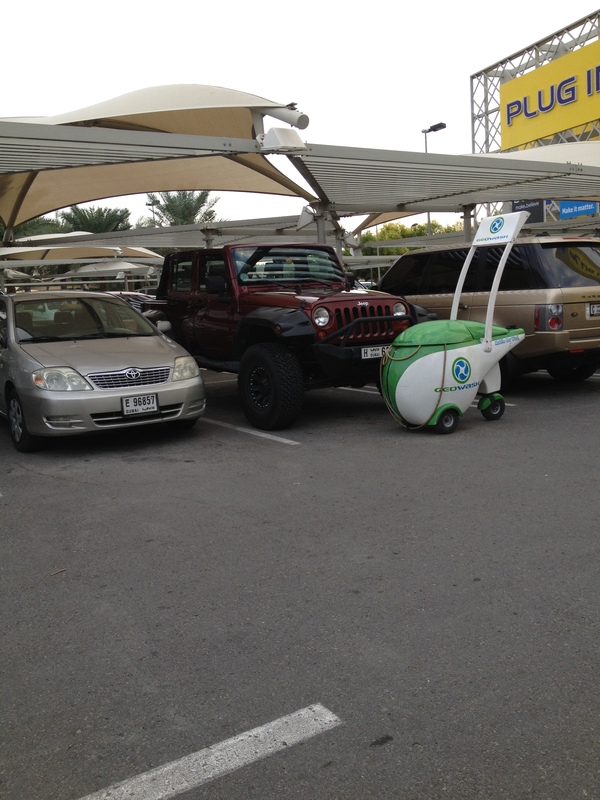 An SUV costs approximately AED25 ($8) and a sedan AED20 ($6) plus tip. But it certainly is nice to get out of a dusty, dirty car in the parking garage, and when you return to it (not always as easy as it sounds, BTW! These parking garages are HUGE, multi-story, multiple entrances to the malls, on multiple levels!) and return to something sparkling and shiny clean. For cheap.